I heard the news on the radio this morning that McDonald’s beloved rack-of-ribs-shaped pork sandwich is back in some 9,000 stores for another limited run, and knew that millions were rejoicing in the magical barbeque patty’s return. McRib’s triumphant return also reminded me of a stroke of brilliance McDonald’s did a few years back, pulling back the curtain on how exactly they make this iconic burger alternative. The Golden Arches (or “The Big Yellow M” as our Little Tyke calls it) represents one of the most-recognized and beloved brands in history. At the same time, however, the brand is no stranger to controversy. The chain has battled concerns over the healthfulness of its food over the years, including infamously caving to pressures to abandon beef fat as the magical ingredient in their best-in-class french fries, substituting a cocktail of vegetable oils and settling for a second-class substitute. In the social media age, fighting such controversies has become more difficult, as would-be crusaders in years past would have had to done what Phil Sokolof did in destroying McDonald’s french fries: spent millions of dollars and found traction in the media for their campaign. Not so today, when everyone seemingly has their own megaphone via Twitter, Facebook or Instagram. “The only thing in a McRib patty is pork, water, salt, dextrose — which is a type of sugar — and preservatives which are BHA, propyl gallate and citric acid which as used to lock in the flavor,” Nanke explains in the video. McDonald’s video-tour of the plant includes every step in the process of manufacturing the McRib, from inspecting tubs of fresh pork shoulders to the shaping and flash-freezing of those rib-shaped patties. When I speak to agriculture groups about the seemingly perpetual disconnect between agribusiness and the consuming public, I frequently mention the problem of the many “black boxes” inherent in agriculture. A black box, by definition, is something you can’t see inside of – you have no idea what is happening inside the box. Particularly in the poultry, meat and dairy industries, many steps of the food production process happen behind closed doors, inside these black boxes. Humans naturally fear that which they cannot see. We’re not actually afraid of the dark… we’re afraid of what monsters may be lurking in the dark to do us harm. And so it is with the black boxes in food production – if we don’t know what’s happening inside the box, some will naturally take the worst-possible view: that the hog farmer is abusing the sows in that biosecure facility, or that McDonald’s is stuffing the McRib full of something other than super-yummy pork. By pulling back the curtain, McDonald’s converted Wes Bellamy, and presumably others who watched the video of his conversion. So McDonald's was monitoring my tweets and saw a picture of what I thought was a McRib and it looked DISGUSTING. Lol I flew out to Oklahoma City to see exactly what was in the McRib. The commercial came out today, hours before my 28th birthday, and now has over 65,000 views on YouTube. I can't lie, I actually LIKED the McRib and I had a GREAT time with my guy Grant from Mythbusters. Check out the video and let me know what you think. Lesson of the day…you NEVER know who's watching your social media page…perfect way to end the best 12 months of my life. Looking forward to the next 12..11/4/14-15 I pray to continue to build the brand! How can your farm or agribusiness organization pull back the curtain on your production process? 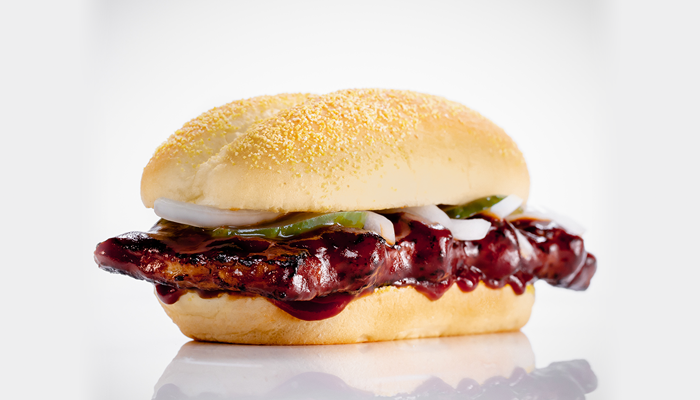 Give it some thought while you chow down on your semi-annual McRib sandwich. ← Reflection: What Defines You?